If you are looking for a cute dessert or for a new creative type of egg decorating this year, then you will love this! You can not go wrong with Oreos and chocolate! Make truffles: Use a food processor to crush cookies into fine crumbs. Add crushed cookies to a medium bowl with cream cheese and stir until evenly combined. Line a baking sheet with parchment paper. Using a small cookie scoop, form mixture into small egg-shaped balls and transfer to prepared baking sheet. Refrigerate until slightly hardened, about 30 minutes. In a medium microwave-safe bowl, combine semisweet chocolate chips and coconut oil. Microwave in 30-second intervals until melted. 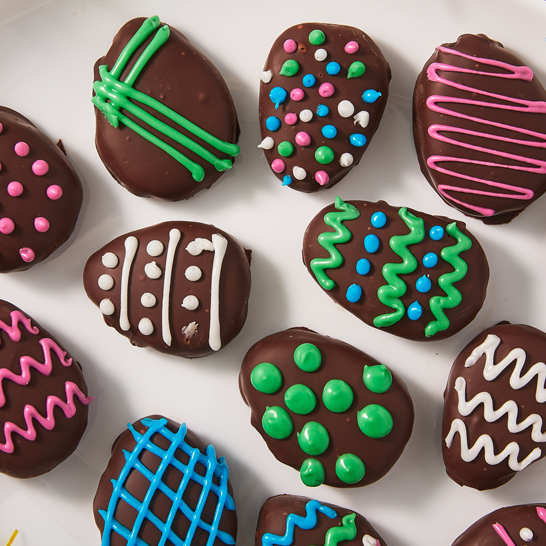 Dip eggs in melted chocolate until coated and return to baking sheet. Refrigerate until hardened, 20 minutes more. Meanwhile, make royal icing: In a medium bowl, combine powdered sugar, corn syrup, and milk. Divide icing between four bowls and dye each one with desired food coloring. Thank you to Delish for this great Easter treat! Click Here to see the video and print the recipe.